A 2006 documentary by Yves Boisset uses uncredited extracts from the film, mixed in with actual news reels, without stating that the film was made nine years after the events which it relates to. Fiction has become a historical document. The Battle of Algiers was directed by the Italian Gillo Pontecorvo and produced by Antonio Musu for Igor Film and Yacef Saadi for Casbah Films. Released in 1966, the film is based on real events during the Algerian War of Independence 1954-1962, and in particular what has been called ‘The Battle of Algiers’. This took place in 1957 in the Algerian capital and saw the French army trying to crush the resistance of the National Liberation Front (FLN). In urban areas, the FLN was a guerilla movement which carried out attacks on both military and civilian targets. In Algiers, the FLN was led by Yacef Saadi, whose memoirs, published shortly after the war, were a key reference point in the making of the film. As well as being co-producer, Saadi also acted in the film, playing himself under the codename “Djafar”. 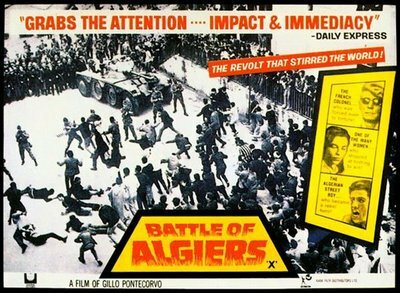 Analysing the context in which The Battle of Algiers was produced gives us key insights into the political, moral and intellectual motivations behind the film. The starting point was early 1962, a few months before Algerian independence in July of that year, when Pontecorvo and Franco Solinas, his co-screen writer and friend, went to Algiers with bogus journalist cards. Fascinated by the events and motivated by their left-wing commitments, they approached senior members of the FLN who helped them to approach people and even to explore some zones where the war was still raging. Pontecorvo and Solinas used all this documentation to write a script about a former paratrooper, Para, which was ultimately never made. Then in 1964, Pontecorvo and Saadi encountered each other: according to Pontecorvo’s biographer, Saadi’s representative Salah Baazi came to Italy. In an interview in 2004, Saadi states that he himself went to Italy to seek out Pontecorvo, inspired by his work and aware of his political sympathies. After his arrest in September 1957, Saadi had written in prison his first memoir Souvenirs de la Bataille d’Alger (Memories of the Battle of Algiers) and was looking for a leftwing, non-French European director to direct the film - Rosi and Visconti were also on his shortlist. Pontecorvo tried to propose his own script Para instead because, he recalls, a script written by an ex-combatant was “quite ugly from a cinematic point of view, or better to tell the truth, it was awful and with a sickeningly propagandistic intention”. Baazi thought that Para treated colonialism from an exclusively European point of view and did not tell the story of the Algerian people. So Pontecorvo and Solinas decided to rewrite everything from scratch and were willing to take the risk of working for nothing and taking the time needed, however long that might be. In compensation, Saadi was supposed to help them to contact key figures and finance a new trip to Algiers in order to help them document their new script. In summer 1965, the production of the film started and lasted for just over four months. The cost of the film was around $800,000. After a long struggle to find an Italian co-producer, Antonio Musu, who had just created his new company Igor Film, completed the funding already provided by the Algerian government via Casbah Films, a company whose ownership was shared between Yacef Saadi and the Algerian state. Yacef had always been a fan of gangster films and an avid filmgoer. When he was eight he was an extra in the French film noir Pépé le Moko (Julien Duvivier, 1937), shot partly on location in the Algiers Casbah. The existence of Casbah films was unprecedented in a socialist country in which no private enterprise existed. Saadi had the full backing and support of the new Algerian president Houari Boumediène who had overthrown Ahmed Ben Bella after the coup d’état of June 1965. Indeed, local residents of Algiers thought that the tanks on the street at the moment of the coup were part of the film set. Pontecorvo and Saadi have given a number of interviews about the production of the film and various conflicting elements have emerged. In a 1967 article about the making of the film, Pontecorvo states that the script was based on “thousands of eyewitness accounts, documents, photographs” and does not specifically mention Saadi’s memoirs. Saadi on the other hand has been very vocal in emphasising his individual role and importance, and has recently complained about being sidelined in the credits of the 2004 re-release. Since the making of the film and especially since it won the Golden Lion at the Venice Film Festival in 1966, Saadi has made a livelihood from talking about the film and in particular has been much more solicited since 9/11, more on which below. Indeed comparing Saadi’s many TV and press interviews reveals internal contradictions in his version of events (both about the film and the real “Battle of Algiers”), from boldly defending the FLN’s guerrilla methods in some interviews to regretting having blood on his hand in others, notably in Yves Boisset’s documentary La Bataille d’Alger in 2006. The second key feature which emerges from analysing the production of the film is the importance of the historical context and in particular intellectual currents at the time such as Marxism and Third Worldism. On the film’s release Pauline Kael wrote in the New Yorker: “The burning passion of Pontecorvo acts directly on your emotions. He is the most dangerous kind of Marxist: a Marxist poet”. In the 1960s, newly independent countries such Algeria attracted European Marxist intellectuals, disillusioned with the USSR (particularly since 1956) and looking for a new location for a socialist revolution. Often they were quite surprised when their visions of African revolution did not correspond to the reality on the ground. For example, Pontecorvo found it hard to recruit actresses for the film in Algeria, because of strict social codes separating the male and female spheres - this is ironic given the way in which women are shown in new roles in the film. When looking at the production history of the film we realise that the Italian co-producer needed the cultural knowledge and access to the Casbah provided by the Algerian producer and at the same time the film could not have been made without the technical competence of the Italians. Both were mutually dependent on the other, emphasising the many and complex forces at play in the production of the film, practical constraints and parameters which determine its final form as much as the script and actors. Finally, the production of the film demonstrates the importance which the Algerian state gave to creating its version of the Algerian War of Independence and a collective memory based on unity in fighting for a nationalist goal. The documentary aesthetic of the film provided the Algerian nation with the archives of its struggle. Pontecorvo once said, “the ideal director should be three-quarters Rossellini and one-quarter Eisenstein”. An analysis of the visual style of the film cannot be separated from its historical and ideological context as well as broader aspects of visual culture in the 1960s. The aesthetic of the film is intrinsically linked to the message its seeks to convey, so Pontecorvo wanted to make a choral film in which the only hero is the Algerian people - indeed, the slogan of newly independent Algeria was “one sole hero, the people” and the focus on the history of the mass could also be seen as influenced by Pontecorvo’s Marxist sympathies. Pontecorvo decided to work only with non-professional actors. The only exception is Jean Martin who plays the part of Colonel Mathieu. The screenplay contains 138 roles. Most of them were cast in the street and in prisons. Pontecorvo was obsessed by the faces of his actors: “la Faccia”. In the opening scene for instance where we see a member of the FLN tortured by the French army, Pontecorvo had to convince the vice-minister of the interior to have a special authorisation to free the prisoner for the duration of the shooting just because he liked the face of the prisoner. The visual style of the film was deliberately close to a documentary news style: Pontecorvo liked to cite an English critic who described his film as a neo-realist work influenced by a decade of television experience. His use of grainy textures and black and white aimed to reproduce newsreels of the time to provide the “tone of truth”. The aesthetic which is both realist and emotionally powerful at the same time is what Pontecorvo calls “the dictatorship of truth”, an effect created technically by making a duplicate negative from a positive print (a dupe negative). The film looks so realistic that it was seen as necessary to warn the audience in the opening credits of the 2004 re-release that the film contains “not a single frame of documentary or news footage”. The documentary style and “truth” of the film means that extracts are regularly used to illustrate actual documentaries, for example a 2006 documentary by Yves Boisset mentioned above, also called The Battle of Algiers, uses uncredited extracts from the film, mixed in with actual news reels, without stating that the scenes are from a film made nine years after the events which it relates to. In this way the fiction has become a historical document. 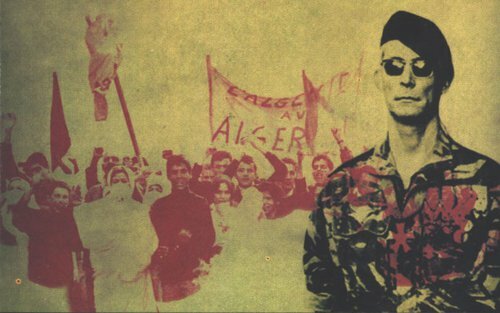 This article is part of the Algeria and the Arab Revolutions: Pasts, Presents and Futures partnership, funded by the Universities of Portsmouth and Sussex. Read more about openDemocracy's editorial partnerships programme.